This article began when I asked for information on cancels consisting of a letter W and a number in a single or double circle and was told that Everybody knew they were from Vienna, and it was all written down in an article that nobody could actually find. I have found in the past that Everybody is getting older and his recollections are not always correct, so I decided to dig deeper. First I looked for "dumb"in the Index for 'Austria'. The suggested joint study seemed a good idea at the time, and probably still is… The 67/20 article consistently refers to " W · 1 " (W dot one) although the illustrations also have it with no dot. The follow-up article (94/22 - 6 years later!) produced a W101 cancel on the 1908 issue, and W1s from all periods from 1916 and in all sizes from 16mm to 21mm. "Wavy line" cancels were also mentioned, and the remaining 'Austria' references dealt only with them. However this didn't tell me why " W · nn " cancels were used instead of a "normal" cancel - or a pen stroke - nor what other date-and-place-free cancels might exist. So I turned to the APS Library index. Items 163 and 291 looked relevant; but consultation with the Librarian soon put paid to that idea. Item 212 is W. Tettinek's "Types of Postmarks of the Vienna Post Offices after 1883: a photo-copy of a typed translation by F.F.M.". It added that " W · nn " cancels in single or double rings were introduced around 1900. The introduction to Klein's catalogue (Library item 31) states "Mute postmarks are those which do not contain the name of the place from which they originate. During the years 1887-1900 they were used without exception as arrival cancellations, possibly also at transit Post Offices if the dispatch Post Office had failed to cancel stamps or had done so insufficiently. The intention being, in the latter case, to prevent a fraudulent second use of the same stamp." However, someone had by now found a reference to articles in Die Briefmarke, issues for Dec 1964 & Mar 1965. Müller's catalogue (library item 7) observes that "all kinds of designs and various ornaments were used for these cancellers; they were used during the early stamp period to cancel the stamp, and a separate place-and-date canceller used alongside". The ANK catalogue repeats all of Müller's illustrations, the Michel some. Votoček (library item 46) provides confirming, or in a few cases contradicting, information on the Czechoslovak area. Stohl's Handbook (library item 313B1,2) Sections N on Nachentwertungen (Dumb Cancels) adds a few more shapes (eg a double circle with fuzzy, fat rings; an oval) and extends the recorded usage into the 1970s. The reissue of Klein by Rieger adds three new Dumb Cancels, of unknown place of use and found on the 1890 issue. Kainz throws some intense shafts of light into dusty corners. And further articles in Die Briefmarke have been found (9/68; 7/93; 8/93). So now I have a large pile of information, and can try to reduce it to a coherent and correct story - the scope of which has suffered from "mission creep" and expanded to include all Dumb Cancels. However, postal cancels intended for other duties but for good or bad reason applied to stamps (eg "Nach Abgang der Post") are NOT covered. (a) The originating office applied the dumb cancel. This occurs mainly on the first stamp issues, chiefly because the place-name was applied by another cancel beside or on the stamp itself. A wide and weird variety of these is found! (b) The dumb cancel was used at the delivery office, if the originating office had omitted to cancel the stamps or had done so weakly, to prevent improper reuse of the stamps without putting the name of the delivery office or the time of the cancellation. This was done from 1850 and is still practised today. (c) As (b) but at a transit office. The dumb cancels used on the first stamps, which the postmasters produced personally, show diverse forms and belong to the most popular collecting fields of Old Austria. The later dumb cancels do not reach an equal wealth of forms, but are still imaginative and of interest - and are cheaper! The cancels that Müller and Votoček list are almost all used ONLY on the first issue, normally with a "town name plus date" canceller alongside. A few were used later as arrival marks, and for "arrived uncancelled" purposes. A very few were still in use in the period covered by Klein. Klein's article lists 25 different dumb cancels, used from 1867 to 1900, which are shown in my second set of illustrations. All bar one (no. 2) are also in his catalogue, but that contains 4 cancels not in the article, to which I give the numbers 26-29. The post-1900 story is documented in various articles in Die Briefmarke, and is quite varied. The cancels from known places are listed next. Mü numbers are references to the Müller catalogue and V to the Votoček; D-numbers are Votoček's illustrations. 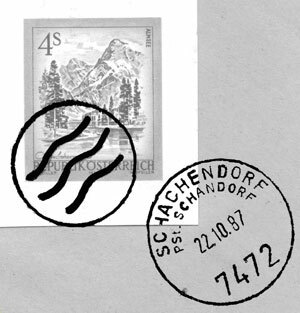 Votoček illustrates the Potschatek cancel on a stamp along with a town-date one (synthesised here). This shows that he is correct and Müller (& ANK) in which the rings have no central hole are wrong. Müller lists these next three (his Mü3214f, g, h) as used at Vienna. The first and second were used on "Stadtbrief", ie local letters; the third was used as an arrival mark and also as a dumb cancel on 1850 - 1860 issues. The first had its dots removed and became Klein's "variant-of-7", discussed in Period II below. The third can be distinguished from the Gran cancel above because it is lozenge-shaped, Gran being a square rotated 45 degrees. Müller also has 3214u (3 rings with '1' inside) and 3214dz (4 rings with '1' inside), which remained in use in my Period II and appear there as items 8 and 5 respectively. Finally, the location of these is unknown; they are listed as Mü3611a, b, c, d, e and recorded by Müller on issues 1, 1, 4, 5, nil respectively. The three-ring cancel may be Klein's number 9. This is covered by Klein in his articles and catalogue, in Die Briefmarke, and by Votoček. Cancel 1 has been proved to originate from Brünn; it is rare on the 1867 issue, more frequent on the later issues. Its Klein catalogue number is 512-o and its illustration number is 662. It is known on the 1890 to 1913 issues. Votoček states that it was first used in the Head Post Office in Brünn around 1870. 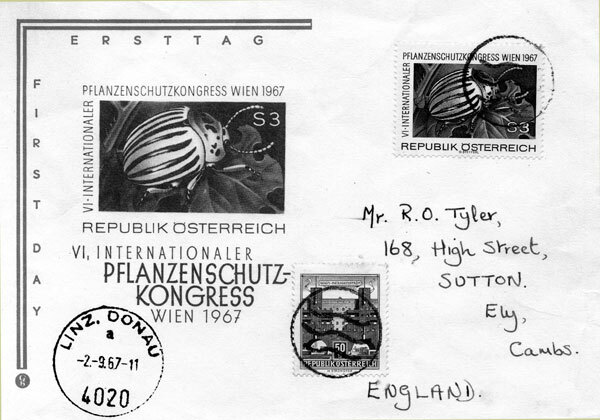 Cancel 2 with three equally-spaced rings is from the Austrian post office in Constantinople. It is thus not in Klein's catalogue. It is known on the 1890 issue. Later it was damaged, and resembled a C in a single circle. Cancel 3 is almost certainly from Görz (as stated in "Die Postmarke" for 1928!). See also 'Austria' issue 128 pp 59 for a deeper analysis. Its Klein catalogue number is 1333-l and its illustration number 663. It is known on the 1890 issue. Cancel 4 occurs as a rule as an arrival cancel on Retourrezepisses, thus along with a second cancel, but also occurs alone on stamps. The letters "AP" are the abbreviation for "avis de payé". Again, see 'Austria' issue 128 page 59. Its Klein catalogue number is 5737-u and its illustration number is 669; it is also Müller catalogue number 3214-v. It is known on all issues up to 1867. Cancel 6 with ten circles has been found only on Aufgaberezepissen between 1869 & 1890, where it served to overstamp invalid cancels. It has not yet been found on stamps. Klein catalogue number 5737-t; illustration no. 668. Cancel 7 is from the Vienna Head Post Office; it emerged from cancel 5 through removal of the numeral 1 around 1871. Klein catalogue number 5737-r; illustration no. 665. It is known on the 1867, 1883 & 1890 issues. A variant of cancel 7 exists with four circles of somewhat smaller diameter. This appears to have been produced by the removal of the nine points contained in the innermost circle of Müller's type 3214-f. 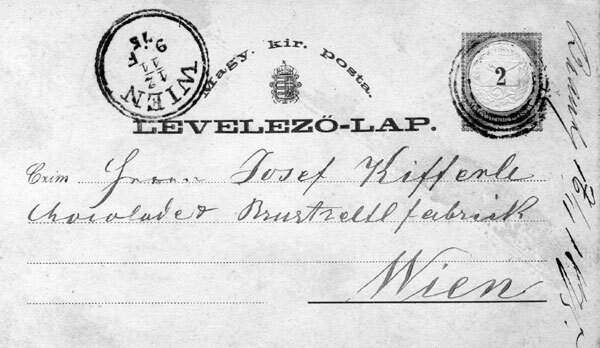 Cancel 8 is from the Vienna Head Post Office. Klein catalogue number 5737-p; illustration no. 666; it is also Müller catalogue number 3214-u. It is known on all issues up to 1890, on letters and newspapers. There are many distinguishable subtypes of the numeral '1'. Cancel 9 is from the Vienna Head Post Office; it emerged from a cancel 8 through removal of the numeral 1. Klein catalogue number 5737-s; illustration no. 667. It is known on the 1867, 1883 & 1890 issues. It may also be that cancel recorded as Mü3611c - see the last illustrations of Period I above. 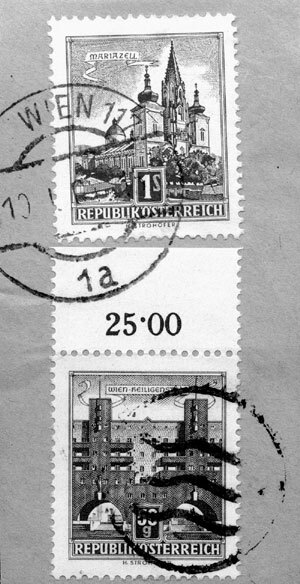 Cancels 10 - 15 are "counter letters" from the Vienna Head Post Office; their circles and lines differ from the other such cancels listed here. Klein catalogue numbers 5737-d4, -e4, -f4, -g4 & -h4; illustration nos 676 - 681. They are known on the 1890 & 1900 issues. The following comments on ringed roman number cancels are by Klein. BUT, there is a different view on their origin: see note at end of this section. 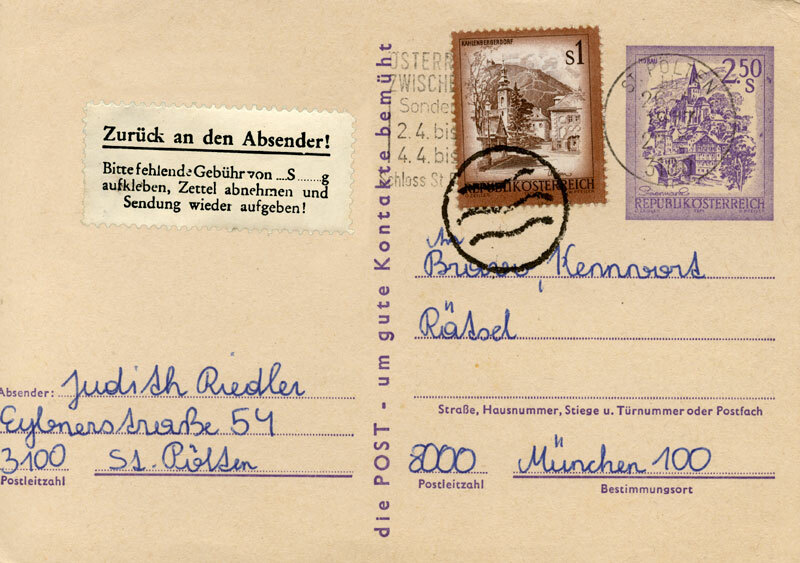 Cancel 16 is from the post office Altmannsdorf, Vienna 86. Klein catalogue no. 5797-e; illustration no. 670; known on the 1890 issue. Pfalz (Die Briefmarke 8/1993) seems to assign an identical cancel to Währing, Vienna 110 (unless the text actually refers to cancel 19 below). 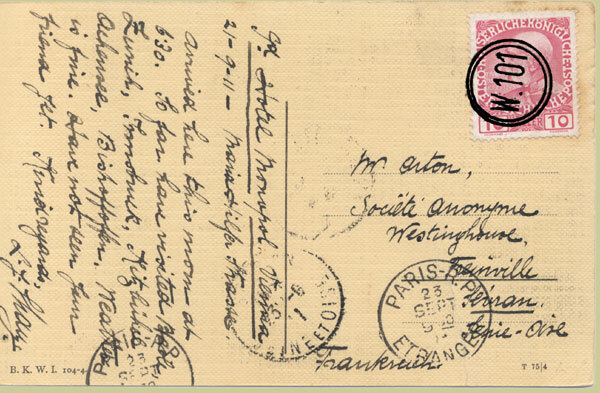 Cancel 17 up to now has been found only on loose stamps but is probably from either Vienna or Prague. Klein catalogue no. 6187-b; illustration no 683; known on the 1890 issue. Cancel 18 is from the post office Neubau II, Vienna 62. Klein catalogue no. 5777-o; illustration no 672; known on the 1890 issue. Cancel 19 is from the post office at Währing, Vienna 110; Klein catalogue no 5820-k; illustration no 673; known on the 1890 issue. Its diagonal bar was occasionally also placed twice on the stamp, as a cross. Votoček lists both bar and cross as in use in 1884 at unknown locations. Pfalz assigns it to Feldsberg! Cancel 20 is from the post office at Favoriten, Vienna 74, Klein catalogue no 5786-c, illustration 674: diameters 13 & 20mm. It is known from the 1883 issue up till 1922. Klein 6187-i appears to be the same cancel. 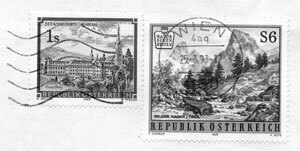 Cancel 21 is from the post office Favoriten II, Vienna 75, Klein catalogue no 5787-c, illustration 675. It can be distinguished from cancel 2 by the unequal spacing of the circles (24, 16 & 10mm). Found from the 1890 issue up to 1932. Cancel 22 was used centrally, probably at the Post Office Savings Bank, states Klein. His catalogue no is 6187-h and illustration no 689. It is known on the 1883 & 1890 issues. Votoček, however, states that cancellations of this type were used from 1884 at many Head Post Offices at the Savings Bank counter, IV being assigned to Prague and V to Brünn. They are found used on 2Kr stamps as that was the fee for an Erlagschein, which is a Giro transfer form - and the cancel can be found on the form itself. Cancel 23 was found on a loose Newspaper stamp of the fine print of the 1867 issue. The numeral suggested to Klein that it was used at a Vienna Post Office in district VIII. Klein catalogue no 6187-e; illustration no 686. Cancel 24 was found on a loose 1890 5Kr stamp. The numeral again suggested a district IX Vienna Post Office. Klein catalogue no 6187-f; illustration no 687. Cancel 25 exists once in black and once in violet on items originating from the year 1898, sent from two different places to Jägerstrasse in Vienna district II; they show next to the stamp the delivery cancel of the post office Brigittenau, Vienna 37. Vienna had at that time 19 districts and Brigittenau was still a part of the second Viennese district. The Roman II in the cancel evidently means the municipal district, the Arabic 5 the delivery district. Accordingly the ownership of the cancel is proven (to Klein) to be post office 37. Klein catalogue no 5759-f; illustration no 671. Known on cover: expensive. The place of use of cancels 26 - 29 is unknown, states Klein! They are his catalogue nos 6187-a, -c, -d, -g; illustration nos 682, 684, 685, 688. All are known on the 1867 & 1890 issues. These last three are the new discoveries by Rieger, his numbers 1279 (the ring) and 1287 (the roman numbers). He lists them as found on the 1890 issue, place of use unknown. Finally, Pfalz notes an 8-stripe cancel (like the "Striped Lozenge" or Schraffen- stempel but with no wording) found on an August 1898 postcard and thought to be from Kuttenberg / Kutna Hora. In her article "Der österreichische Bezirksstempel und seine Geschichte" in volume 9 of Österreichische Postgeschichte by Dr R Wurth (Library item 232/9), Dr Christine Kainz describes the introduction of District Cancellers, which were used for a variety of financial services provided by the Post Office. [There is a second article in volume 20 but it refers to post-WWII only.] In 1893, each Post- und Telegraphendirektion was assigned a roman number for these purposes, which are tabulated below. Note that they are different from those Votoček notes [Monografia 14 4.7.4 pp 573/663] as used in the trefoil-shaped cancels (see nr 22 above) assigned to Head Post Offices for use at Savings Bank counters. Dipl. Ing. Herwig Rainer's "Stempel-Handbuch der k.u.k. Feldpost in Österreich-Ungarn 1914-1918", second edition, adds the last two lines and clarifies the post-1918 situation. Votoček states [Monografia 14 4.7.2 pp 567/662] that cancellers with single and double circled Roman numbers were issued in 1893 for use at Head Offices for Control Stamps on money orders. Single and double circles are equally common; Votoček suggests that whenever a cancel was ordered a double-ringed duplicate was made and kept as a spare by either the engravers or the Postmaster. The same Roman numbers were used in the 1902 Tarnstempels, discussed in the next section. 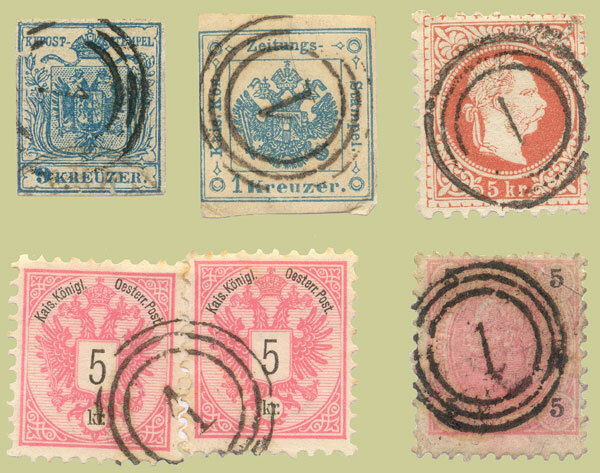 Klein's listing (and Rieger's reissue) shows all cancellers with single and double circled Roman numbers as found on 1890-issue stamps - this is entirely consistent with Votoček and Kainz explanations of their origin. The only discrepancy between a definite assignation by Klein of a place of origin and the above table is item 18 above, a double-ringed VII, which the table says is Prague but Klein says is from Neubau in Vienna (he gives no details as to what it was found on). The other discrepancies are where Klein has the number "suggesting that" it was used at a Vienna district office, but the cancel was found on a loose stamp. Herr Puschmann has suggested that a single-ringed I was an office marking used by the Fahrpost to denote an item for Vienna. I prefer the Votoček - Dr. Kainz explanation. This is a weekly newspaper, dated 27 January 1883, with a 1Kr newspaper tax stamp cancelled with four rings. Dumb cancels are relatively common on these stamps: the next illustration shows three from the author's accumulation, but all that can be said about the dates is "1858 - 1899"! While Ferchenbauer 2000, p1041, shows a triple-ringed 14 described as "Bahnpostamt No 14", this is neither explained in his book nor shown, illustrated or mentioned anywhere else. It may be a fiscal office cancel, and is unlikely to have any railway connection. Gaube (APS Lib 23) notes it as found on 1Kr & 2Kr newspaper stamps. On the left is a Bosnian stamp with a W1 / e cancel. On the right, an 1899 with a 2-ring cancel, possibly no. 20 above from Favoriten. And here, an assortment of "3 rings with '1' inside" on issues from 1850 up to 1900. Finally, a postcard from Neuhaüsel dated 11.11.1875 (according to the message) with a WIEN arrival cancel for 12.11.1875 and a 4-ring dumb cancel (the '2' is part of the imprinted stamp). 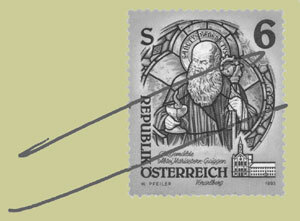 A TARNSTEMPEL is a "hidden" postal marking (cf the Tarnhelm in Wagner's Ring cycle). The Tarnstempel system was introduced in 1902 for use in money transfers. It is a square boxed type hand stamp 13 to 14 mm in size, with Roman numerals at top denoting the province (taken from the list above, eg VII for Prague) and Arabic numbers at the bottom (usually the serial number in the alphabetical-order list of the open offices in the province). They were used occasionally to disguise the origin of mail posted in WWI, although often rendered pointless by manuscript annotations from the sender saying where posted. Typical designs of Tarnstempels found in use in the Galician Postal Directorate (insides traced from specimens, boxes redrawn for clarity). The Roman numeral IX was allocated to the Galician Directorate and a different Arabic number to each Post Office (the same procedure as in other parts of the empire). Stohl illustrates a "military Tarnstempel", with a date inside a single circle with a fat ring; his example is dated Dec 1939 so it may be German. Period III - 1901 on. In 1908-1913, Laibach used L.1 in a double circle. A ring cancel, with "KLAGENFURT 2 Nachtraglich entwertet" surrounding a date-with-time, is a German type used until 1955; a similar item from WIEN 1 lasted till 1949. Several places used black blobs of various sizes (typically 10-12mm dia): Percholdsdorf and Vienna's 3rd, 5th, & 7th districts having been identified. These two examples (place of use unknown) were evidently used no earlier than 1957, when the stamps were issued. Similar blobs are found on "Hitler Heads", the Third Reich stamps with the head obliterated in 1946; items with these always have a conventional cancel on the envelope. The article in 'Austria' issue 67 (1984) page 20 consistently refers to " W · 1 " (W dot one) although the illustrations also have it with no dot. Conversely, the follow-up in 1990 refers exclusively to a dot-free "W1" while most of the illustrations are dotted. The article states that W24, W40, W41, W50, W65 and W77 have also been noted. The follow-up produced a W101 cancel on the 1908 issue, and W1s from all periods from 1916 and in all sizes from 16mm to 21mm. "W-dot-number" in single and double circles are both common, and according to Tettinek were introduced "at the turn of the century" There is a suggestion that sharp strikes are genuine while some fuzzy ones could be forgeries, especially if purporting to be from the Anschluβ period. Pfalz & Werner give a list of other W-cancels seen. Normally these are found in black; W89 is known in reddish violet. 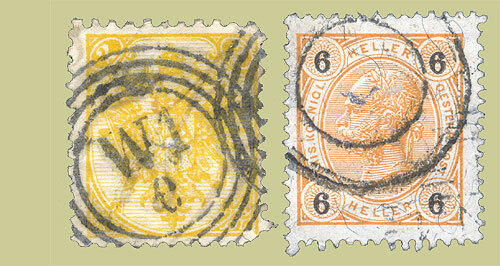 W1/4 occurs on Hindenberg stamps. Less usual ones include a 16½x13mm rectangular cancel with rounded corners from W66 (1908-1932 issues) and a 20 & 17½mm double ring with nothing inside it, known 1908-1935 including two specimens traced to Wien 89 in 1930 & 1932. One unusual documented use of a " W · 1 " cancel was for some of the mail from the Austrian artillery unit at Gallipoli in 1915; this had no Fieldpost unit of its own, according to Tranmer, and its post went via Vienna (alternatively via Budapest where it was given a Budapest 72 mark). The next W101 examples must be after 11 June 1961 (L) and 4 March 1949 (R). By this I refer to dumb cancellations with three wavy lines in a single circle 22 to 24mm in diameter, sometimes with 5 longer wavy lines alongside. The lines can be sharp or broad. If there is no circle, the cancel is not Austrian but Swiss! Short articles in Die Briefmarke (Dec 1989 & Dec 1993) add the information that these cancels are called Nachentwertungsstempel. (Informally, they are also called 'Donauwellen' - Danube waves.) "Since a postal cancel confirms the time and place of posting as an official record, the town-date cancellation of the office of posting cannot be added later, nor can that of the delivery or transit office be used. The stamp must therefore be cancelled with a neutral strike. Where one is not available - especially if the missing cancellation is first observed by the actual deliverer - regulations require that the stamp must be crossed out by a crayon, ink or ballpoint". They are also found with adjacent slogans. This is a cut-out piece of a Postal Stationery envelope, glued on an envelope and used to obtain a Postablage cancellation. The use is genuine, and was permitted by the rules at that date, but it's rather contrived to say the least! And this is a typical use of a dumb cancel: the top stamp is machine-cancelled, and the bottom one has received a dumb cancel to prevent reuse. For the sake of completeness (or pedantry) I'll show some other ways whereby a loose stamp can fail to have a place-of-posting cancel. on the stamp is Kyleakin in Scotland! Canceller normal but two stamps used. The imprinted stamp on the card is cancelled 26.4.1977, at which date the inland postcard rate was 2S50. However the card is to Germany, which is Foreign; also as it only has a 2-word message ("Bjoern Borg") on the reverse it counts as Foreign Printed Matter for which the rate was 3S. The small green-on-white label says "Please stick on [stamps to the value of] the missing postage of --S--, remove the label and re-post the item". (The amount is often omitted; I deduce there was a second part to the label.) This tells the sender what to do, explains to the postman why a part-cancelled item is being re-presented, and avoids the complexity of international postage dues: everybody benefits! This system was also used for overweight letters. The second-time stamps received a dumb cancel; such items can also be found with two cancels of differing dates.